Israeli soldiers injured, on Monday at night, many Palestinians in the al-Fawwar refugee camp, south of Hebron, in the southern part of the occupied West Bank. 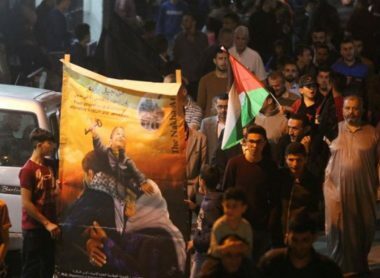 Media sources in Hebron said the soldiers attacked dozens of Palestinians, who marched against the ongoing illegal occupation, and marking the Nakba Day. The soldiers fired dozens of gas bombs, and rubber-coated steel bullets, causing scores of Palestinians to suffer the effects of teargas inhalation. In addition, the army invaded and ransacked many homes in the southern part of Hebron city, and interrogated many Palestinians for hours, after the soldiers claimed shots were fired at their vehicles in the area. The invasions also targeted the Ibrahimiyya area, and Jaber neighborhood, allegedly looking for the Palestinians who fired at them. The Palestinians are marking the 70th anniversary of Nakba Day when Israel was created in the historic land of Palestine in 1948.